As August drew into September the wildlife just continued to put on a better show. 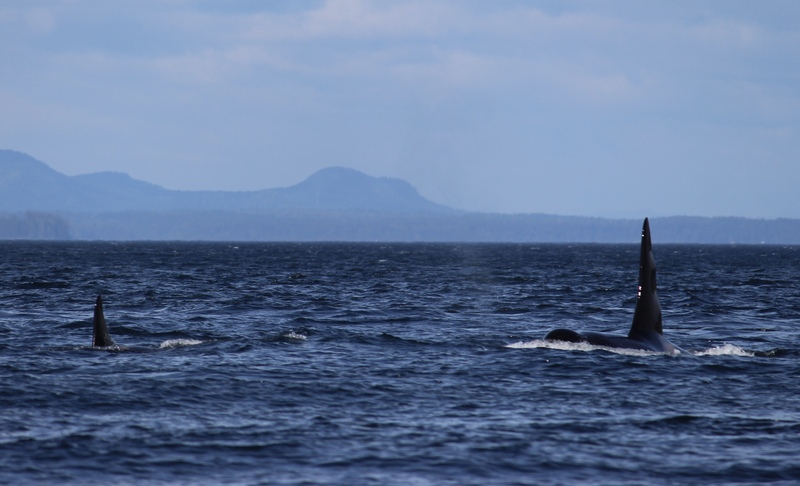 Orca were passing by almost daily, singing, flirting, spyhopping and breeching playfully. The humpbacks continued to steal the show though. Often it seemed like a competition between the two to draw the most attention, Orcas to the left, humpbacks breeching to the right. Sealions were now drawing into Blackfish sound in larger numbers, groaning loudly as they fished and frolicked. 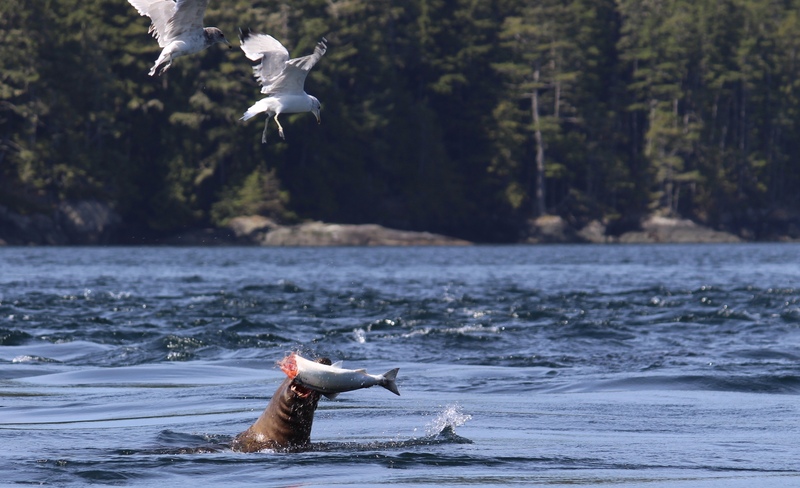 I think my most fascinatingly morbid photo of the summer has to be sea lion vs salmon. The Stellar Sealion had already decapitated the fish and was now tussling with his body to rip off bitesize chunks, forever under attack from the opportunistic gulls. Another surprise contender to the September wildlife scene was the Douglas squirrel. While they have been busy all summer chomping cones, their diet has upped the anti as they nest and prepare for a cold winter ahead. Squirrels have began to hone in on the selection of snacks we leave on the bar for guests and nibble chocolate cake or the daily delicacy. A particularly brazen squirrel, since named Bevan, took off with a squirrel which was an even match for his body size. As the scone didn’t benefit from the camouflage the squirrel has, it looked like a walking scone which caused a split second of confusion. As the nights draw in earlier, we even identified a flying squirrel, since named Flynn, on his nocturnal visits to the dish draw. His big eyes and bushier tale separating him from our daytime population. Banana slugs have also been a presence through the summer at camp, but as the end of the season becomes more apparent we have noticed them curled up in pairs on the trail. At first this was rather endearing to the not-so-beautiful slugs, however we later learned this was a tussle for dominance. The slugs are trying to bite each others penises off, the successor will be able to mate with the other one. The wonderful world of nature. Another summer showdown was the battle of our resident blue heron who liked to stand gracefully on the ball kelp in our bay. This also happened to be the favourite fishing spot of the seals and when they came to close and slapped their flippers the heron would squark blue murder. 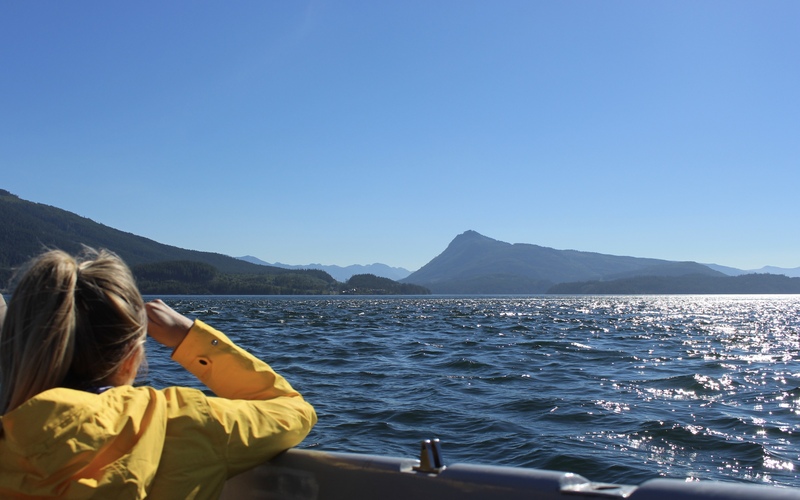 We discovered the Orca sense of humour when out watching a pod travel up Johnstone Strait. As they cruised by rather spread out, the Tenzing floated in the middle with the hydrophone in the water to listen out for calls. 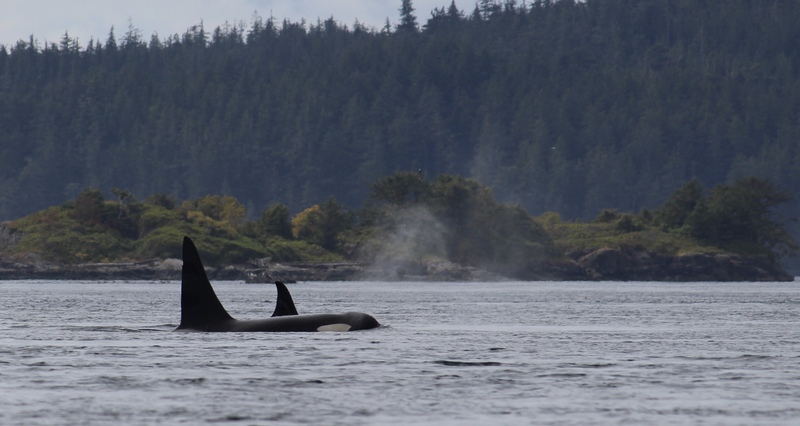 You can sometimes hear both the squeaky calls of the singing orca as well as the click click click of their echo location. One pesky Orca swam right up to the microphone and tested out a bit of Karaoke as he passed by, sending his best solo into stereo. Not to be outdone on the humour front, a humpback covered us in whale snot. 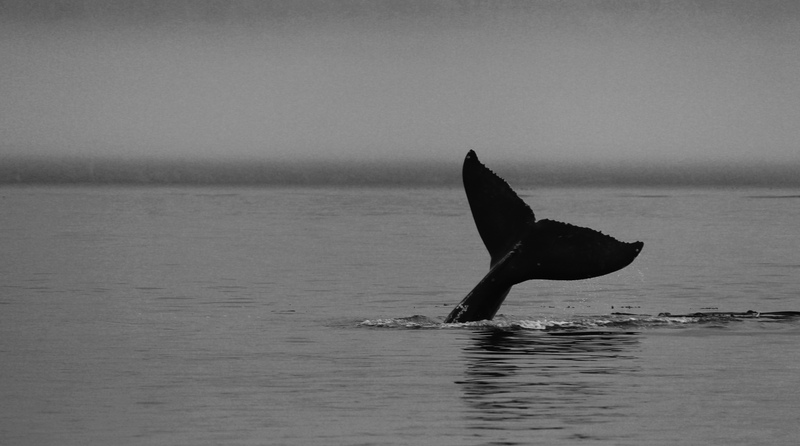 Unpredictable in their surfacing, humpbacks creep up on us with ease and managed to blow right by the boat. With the wind heading for us, a fishy smelling mist encompassed us. Mmm, Whales with halitosis! The dark nights have allowed us to experience the bio luminescence in the water which lights up as the water laps the shore. Its twinkling can be encouraged by splashing around in wellies or throwing a few rocks into the water. Our magical place now comes complete with real life marine fairy dust. Hey Lauren and Monique! So fantastic to read of your time on Compton Island – loved and re-read every single piece. You have a wonderful, gentle and witty style Lauren and your photographs are truly stunning. Thank you so much for sharing it all with us. You have had so many guests this summer that you will not remember us back in June (we missed the first few hours on the island…..), but you (and Ray) were such a big part of our unforgettable experience and we feel so privileged to have met you. I see that you are enjoying some time in Mexico now and we wish you the very best of luck for what comes next.